What a difference a week can make. It was kind of like watching the ice go off the lake. It takes forever and all of a sudden it just goes. Don’t get me wrong, there were very good days and very tough days, but the net gain was a good strong bite. Big news for the week – Smallmouth bass on Fire! We didn’t just catch big fish, but we caught big fish and lots of them. What began as a solution for a slow afternoon walleye bite, turned into a super pattern that most anglers wanted to fish at least half the day. It was infectious in camp. Whether you had a good day on pike or walleye, there was always the question if you caught a big bass. And the answer was to go fish for them and be surprised at how big and how many bass could be caught in one day. For the week, WE HAD 178 BASS OVER 17 IN., including 33 – 18’s, 6 – 19’s, and 1 – 20. When they decided to bite, they did, Spinnerbaits, fat raps, rattlin raps, jigs and twister tails, or whatever you had in your tackle box. They did not care. It was one of those few times where everyone caught big fish, no matter what they threw. I like it when it is more of a challenge, but I am not going to make it more complictated than it is. The smallmouth bass bite was ridiculous. The walleye and big pike bite were also really good this week. In fact, I would have lead with the walleye bite if everyone hadn’t been so distracted with the bass bite. The numbers help put things into perspective, I have been bragging about the hot bass bite, but there were also 30 walleyes over 27 in. caught and released for the week, including 7 – 28s, 2 – 29s, and 1 – 30. Walleye volume was variable. When it was on, there were 40 fish over 18 in. reported per day, when it was tough, the guides went bass fishing. The highest daily guide boat total was 56 over 18 in. The big pike bite was not traditional. There were 10 over 37″, including 3- 39s, 2 – 40s, and 1 – 42. Most were targeted, but they were not caught in warm water spawning bays. 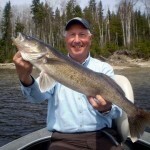 The weather has been variable and most big fish have been caught on the first ambush break outside the warm water area. I get surprised every year, and this year I am shocked at how fast a big smallmouth bass bite can turn from nothing into the only thing that is talked about in camp. 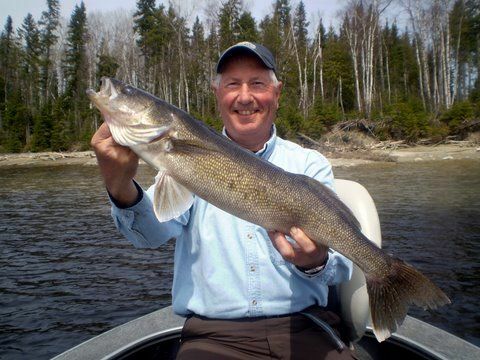 I am a spoiled walleye guide and I love to catch big bass, but the only thing over shadowed by the numbers this week is how good the big walleye bite was for those guys that were chasing them. If you follow along with this thread, you know. I tell it like it is, the good, the bad, and the ugly. This week was just plain fun to guide. Big walleyes and pike showed up when you worked for them, and you could not help but catch great bass when you were on the right spots.